A 14-year-old kid spends his after school hours looking for building materials to resell for pocket money. He hears a noise in an empty building. Suddenly space men appear, do a little fighting, and vanish, leaving a ray gun behind. The kid picks up the gun and takes it home. Myles Truitt plays the latchkey teen with sad enough eyes to gain our sympathy. At home, his adoptive father Dennis Quaid (almost unrecognizable under a scruffy beard) barks orders and maintains discipline. Myles' older brother, played by Jack Reynor, returns from prison owing $60,000 to James Franco, a menacing loan shark. The story escalates to robbery, murder, and a road trip, where the brothers rob a strip joint and dancer Zoe Kravitz joins their adventure. It all comes down to a Nevada town, where the space men, loan sharks, and police converge. The kid pulls out his ray gun and blasts. The space gun is the best thing in the movie, but the finale comes too late to save this. The production looks sloppy. The directing is clunky. The acting is uneven. 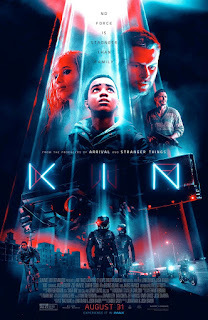 "Kin," 1 star, rated "PG-13." Does it deliver what it promises? Road adventure meets sci-fi. Is it entertaining? Clunky. Is it worth the price of admission? Skip it.